When we asked readers to pick the best small town in the South, they had plenty of options to choose from—so many that we thought we should share their top choices from each state. Step back and consider the winners, and you’ll see some common threads. First of all, location, location, location. Many of the South’s best small towns are nestled into the mountains or perched on the coast, overlooking a river or dotting an open prairie. 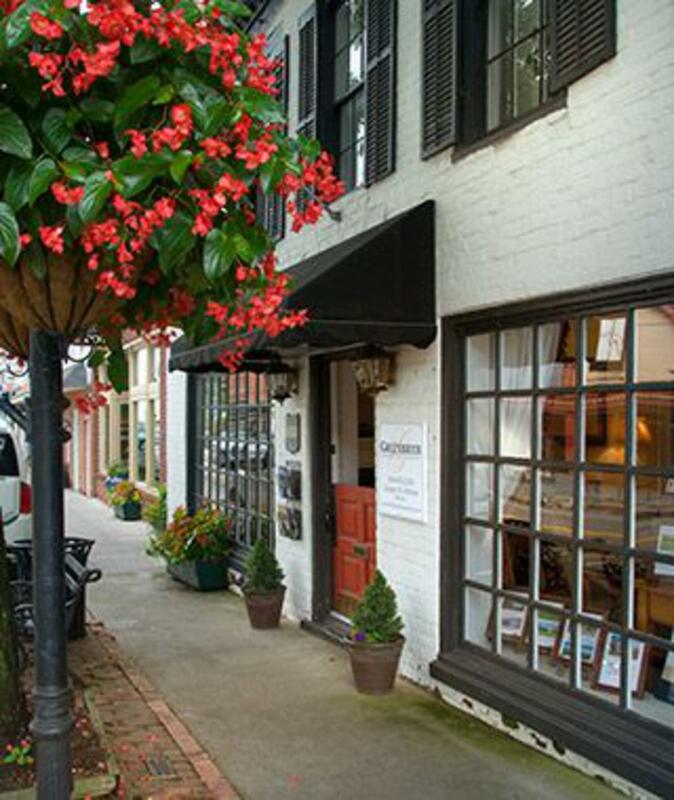 Also, these towns haven’t bulldozed their past but have instead preserved and reimagined it, with historic downtowns that now beckon visitors to art galleries, bookstores, and farm-to-table restaurants. They have genuine character and charm. Perhaps most of all, they have a sense of community and local pride that’s palpable. Here, you’ll find one of only four Carnegie Halls in the world. Step back in time at the General Lewis Inn. Some of its construction dates to 1834, and every room features antiques. Stop throwing away extra paint. Put it to work with one of these clever DIY projects—like using it to dress up wall art, accessories, and accents. 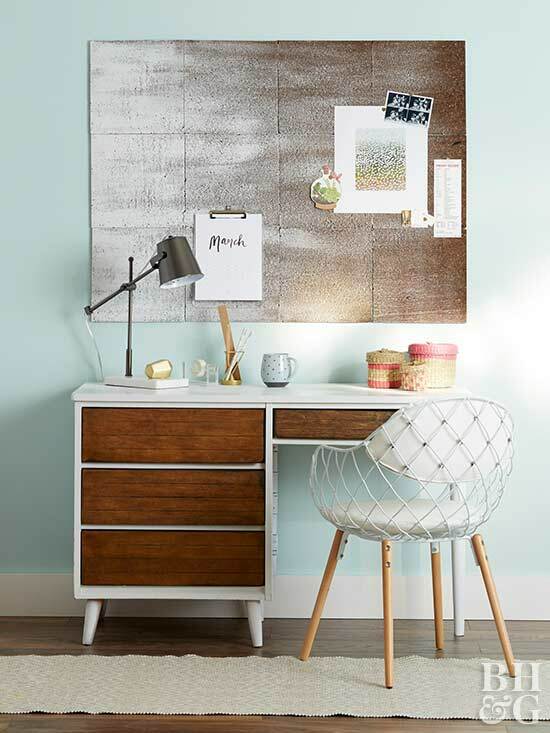 Get this grayscale ombre message board with corkboard and paint. Cluster 12 corkboard panels above your work space, then lay out all the panels, sides touching, on a protected surface in the arrangement you plan to hang. Use a dry-brush technique to paint across the panels. Put a small amount of paint on a brush, and apply in long strokes from left to right to create a gradually diminishing effect. Continue dragging paint until you achieve the desired look. Add pops of color to a desk with one pot of sample paint in a bright shade. 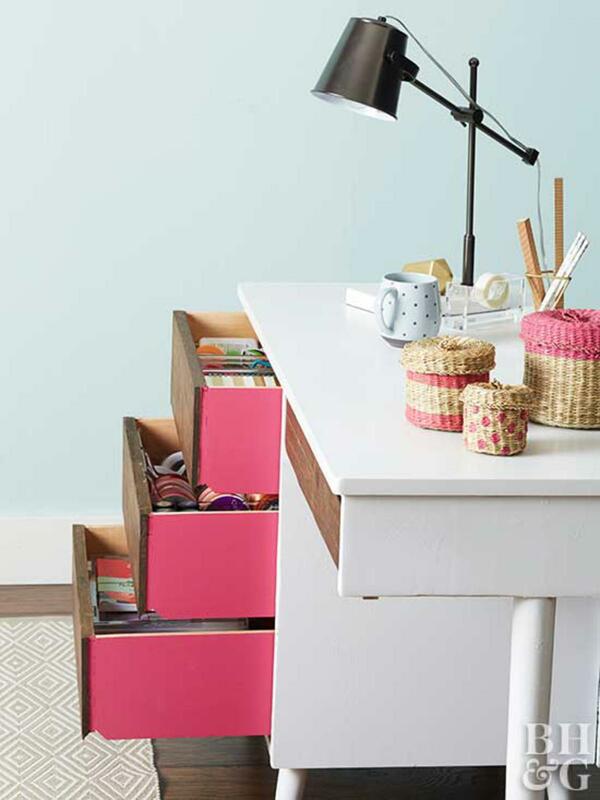 Start by emptying and removing all desk drawers. Sand the drawer sides, and tape off any areas you don't want to paint (like the tops of the drawer sides or the drawer fronts). Prime, let dry, then apply two coats of paint. Apply a coat of clear wax or matte varnish for protection. Allow the paint to cure for a few days before reinstalling the drawers. 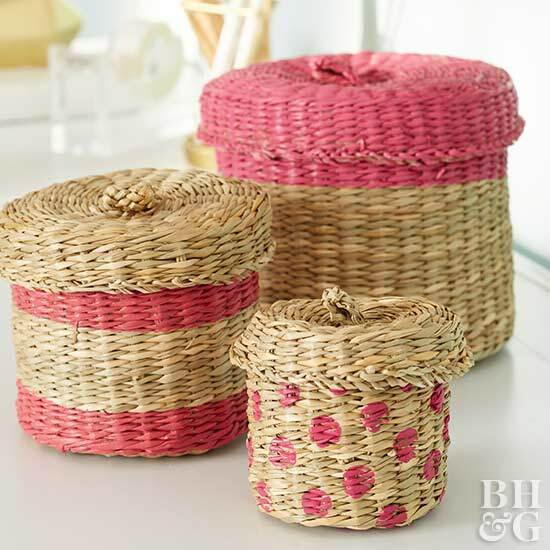 Use paint to add stripes and polka dots to small wicker baskets or other accessories. This trick works especially well when you have only a trace amount of paint left, ensuring that not a single drop goes to waste. Use the accents to match other paint colors in the room, like on the walls or furniture. Apply paint with a small artists brush, and let dry before filling with trinkets. Dress up plain white shelves with a quick color makeover. 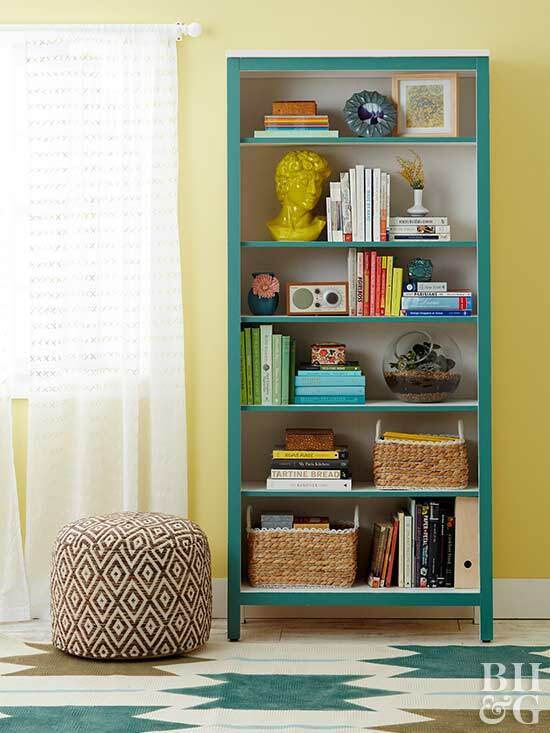 Use a brush or disposable foam roller to prime the face frame of a bookcase and front edge of shelves; let dry. Apply two coats of a single color of sample paint, allowing each coat to dry. Top with a coat of clear wax or matte varnish for extra protection. 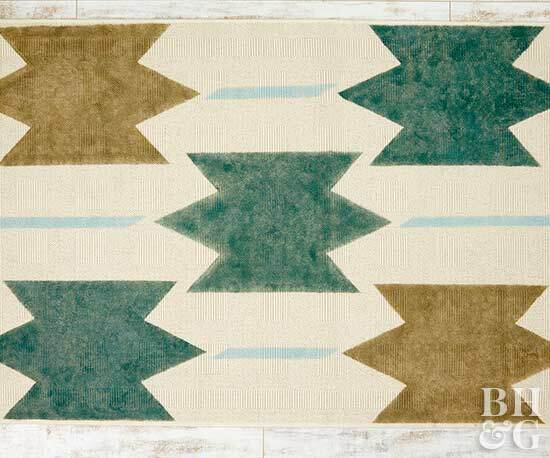 Add a painted pattern to an ordinary cotton rug. Print our Aztec motif, enlarge to fit your rug, trace onto cardboard, and cut out the pattern with a utility knife to create a stencil. We placed our stencil in the center and each corner of the rug. 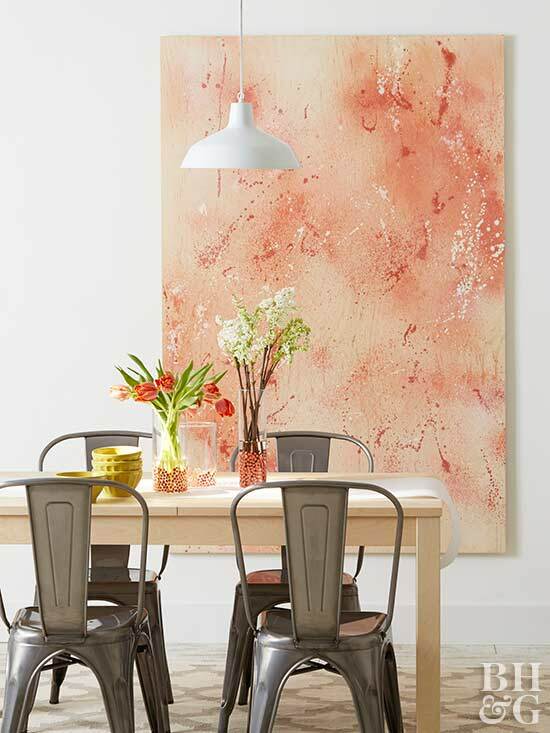 Use a 2-inch stencil brush to lightly fill in the shape, dipping the brush in paint, wiping off excess paint on scrap cardboard, and dabbing it on the rug. To create the lines between the stenciled shapes, use painters tape to create 2-inch-wide strips with angled ends. After painting, remove tape and let dry for several days before using. Tie a room together with leftover sample paint applied to blah curtain panels. 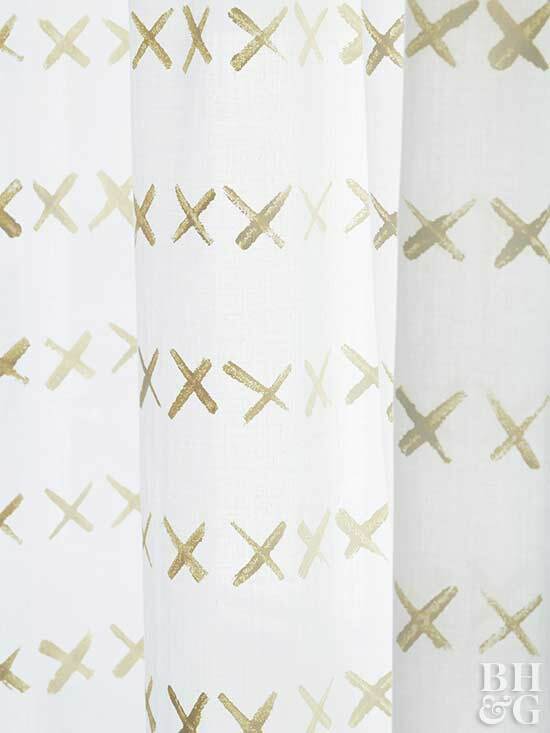 Begin by ironing curtains and laying them on top of a work surface covered in kraft paper. Use a 1-inch foam brush to paint a row of irregular Xs, using the top brush edge as your stamp. We placed the first row of Xs at the top of the curtain panel, just below the rod pocket. We used a ruler to evenly space the rows 1 inch apart. Lift the curtain panel after completing a few rows so that the fabric and paper don't stick together while the paint dries. This paint treatment will hold up to a gentle wash with a mild detergent. Hang the panel to air-dry. A homemade abstract masterpiece is easy with any level of artistic talent and a couple pots of sample paint. Sand one side of a birch plywood panel and wipe away dust. Lay the plywood on a plastic drop cloth. Unscrew the nozzle from a spray bottle and put the tube in a dark paint sample. Hold the sprayer at least 2 inches above the plywood to get a good range of spray. After you spray the desired amount of full-strength paint, insert the nozzle in a jar of water and apply thinned paint to create a muted, misty look. Alternate between undiluted paint and water until you have the desired amount of your first color, then repeat the process with a second color. Allow the panel to dry flat to avoid runs or drips. To hang the art, use a French cleat. Cut two 1×4s to a few inches shorter than your piece's width. Use a circular saw to cut 45-degree angles along one long side of each board. Screw one strip to the back of the artwork using three or four 1-1/2-inch screws; attach the other board to the wall. Position the strips so the angles lock together. Then attach two small boards to the back bottom of the painting to hold it out from the wall the same distance as the cleat. 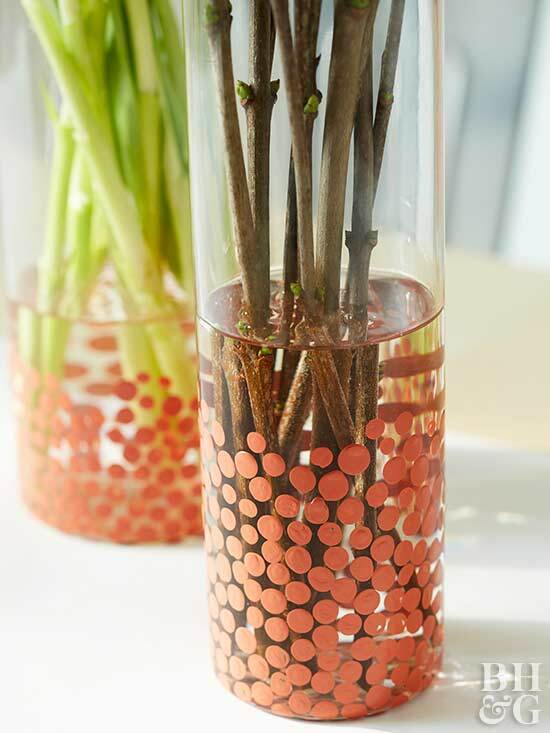 Add subtle style to plain glassware, like these simple vases. Using the eraser on a new pencil, stamp polka-dots on the bottom and up the sides of the vase. Allow to dry and let cure for a few days before using. Because sample paint is not permanent on glass, you can scratch or wash off as your style needs change. West Virginia is the prime location in the southeast for skiing and snowboarding, with some of the most challenging trails in the nation. Natural snowmaking, high peaks, long runs and unsurpassed beauty make for a skiing experience like no other. Canaan Valley has 43 trails for both beginner and advanced skiers in the heart of Tucker County. The most famous trails at Canaan are Prosperity and Dark Side of the Moon, which are both black diamond fan favorites for thrill seekers. Canaan also boasts a 4,280-foot mountain top, making for a winter backdrop like no other. For more seasoned skiers looking for a new challenge or their first black diamond run, Widowmaker and Choker at Snowshoe Mountain are quite an experience. These trails at the basin area of the mountain boast an 800-foot vertical drop and 100% snowmaking. The western territory’s steep, rugged terrain also has some of the most challenging trails for advanced skiers, like Cupp Run and Shay’s Revenge. Timberline Resort boasts at 4,268-foot summit with 41 slopes. Their single black diamond runs are some of the best in the southeast, including the popular White Lightning. Salamander is an easy run, but as the longest trail with the highest average vertical south of Vermont, experienced skiers will enjoy it, too. It’s also a great run to experience the breathtaking Dolly Sods Wilderness and Timberline’s cross-country skiing. Winterplace has more than 90 acres of skiing and tubing and 63% of their trails are intermediate and advanced. Nose Dive is well known as a black diamond run that gives you thrills and chills in the winter cold, from near the top of the resort’s 603 vertical foot drop at an elevation of 3,600 feet. As an added bonus, you can keep skiing into the night hours on 26 slopes. We'll tell you right now: plenty. And that's even before you've given the pro the grand tour. 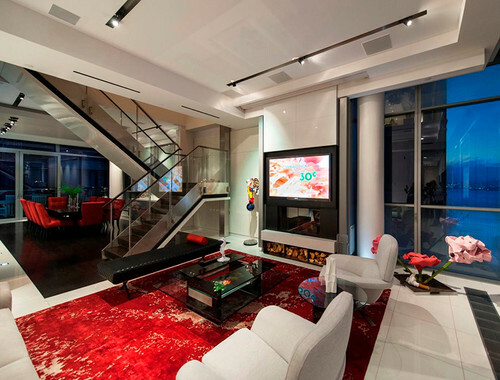 Interior designers, with their sharply honed sensibilities, can take in a space in seconds. In fact, these pros can't help but make a ton of snap judgments—and typically these first impressions aren't all that good. In case you're curious about what jumps out at interior designers when they first enter a home, here's an unsettling glimpse, courtesy of some experts who aren't afraid to spill the beans. But don't beat yourself up if you recognize your home in some of these criticisms; these flaws are entirely fixable. 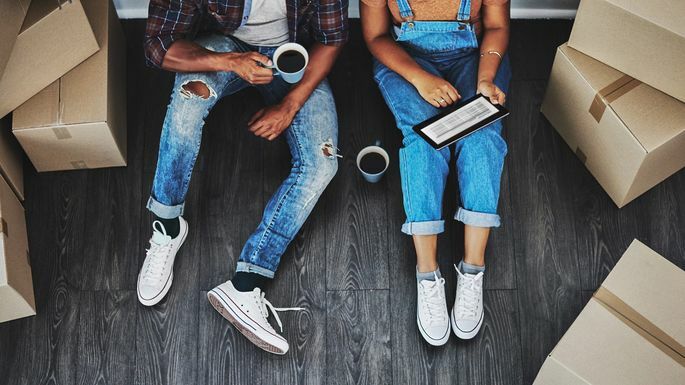 Read on for an inspiring home decor wake-up call. "The first think I notice is whether or not the furniture placement promotes good flow of traffic," notes Lorelie Brown, a Showhomes franchisee in Charleston, SC. 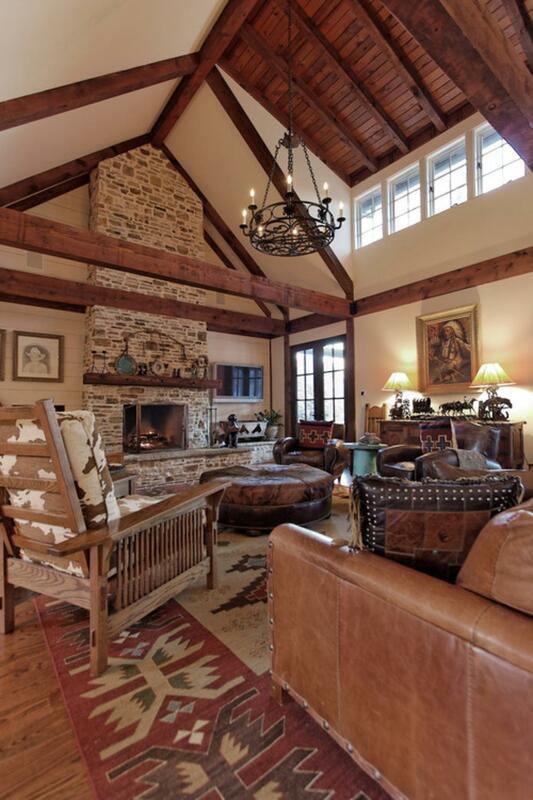 Most living and family rooms have a focal wall that's anchored by a fireplace or television, which means the chairs and couch should be arranged to face this point without causing you to walk awkwardly around them. "I find this problem happens a lot in an open floor plan, with pieces defeating the whole 'open' idea," she adds. "Usually when I walk into a home, the overall look is dark and drab because there's not enough of the right kinds of light," says Anna Shiwlall, a designer with 27 Diamonds in Los Angeles. Of course, we can't all be blessed with a flood of natural light, but you can install what you need rather easily. Sit in each chair or section of the room, and determine whether you can read easily. 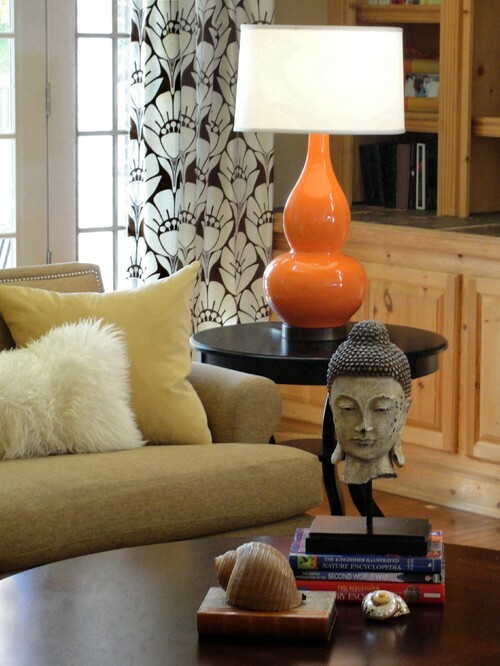 If not, add in the missing table or floor lamps; don't rely on one big overhead light. 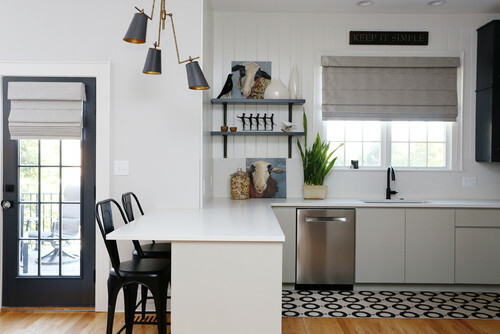 "Just because you have it doesn't mean it needs to be on display," points out Jeanne Hessen, senior designer at Closet Factory in Fort Lauderdale, FL. 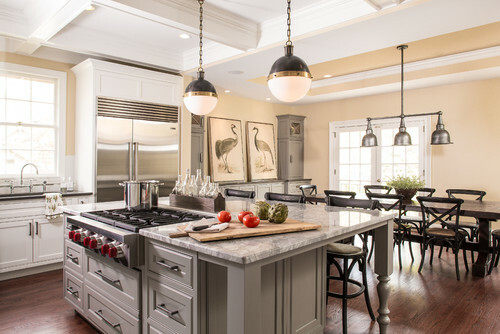 Style continuity is a big one for design pros. If your pieces don't work well together or there's no unifying color or theme to the rooms, the whole look can feel off. "This seems to come from a lack of understanding of the style elements and characteristics of the pieces in the room," explains Mark Sidell, a Closet Factory designer. Too many colors, in particular, can create a sense of disorder. Make it better by choosing a neutral palette and then introducing just a couple of coordinating hues. Truth: Interior designers make snap judgments not just on what they see, but also on what they smell. As a homeowner, you've become inured to your own odors, but an outsider can nail a scent right away. We can't be more emphatic here: Your bathroom must be pristine! 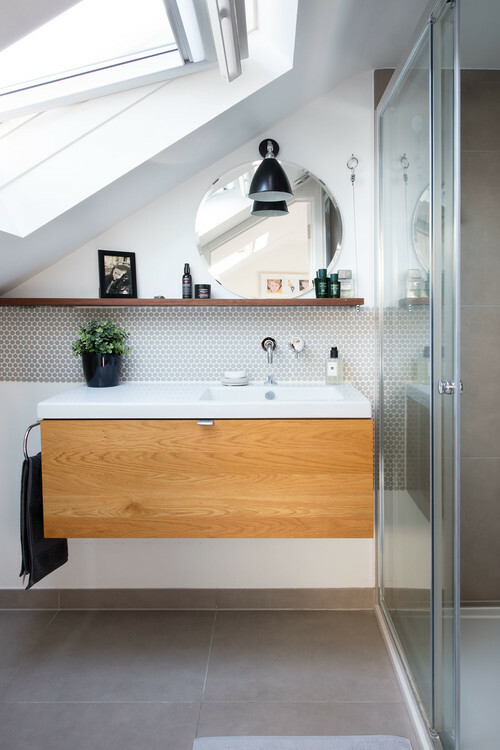 Interior professionals (and potential buyers) will look with a critical eye at every bathroom in your home, and a dirty one will convince them that the entire home isn't clean, even if it is. Towels must be fresh, grout should be clean, and definitely clear your counters of personal items (makeup, hair dryer, toothbrush). We're talking tiny lamps on huge tables, or king-size beds squeezed into too-small rooms. "I always notice the layout and scale of the pieces in a bedroom," says Hessen. Frankly, most people buy whole packages at the furniture store instead of choosing complementary items in the correct sizes for their home. "To fix this, try to mix and match your styles and the stores where you shop," she adds. "You'll end up with a more interesting, inviting space." Let it shine! A lack of personality in a home means your space will appear boring or sterile. Even worse is a look that's been copied directly from a catalog. 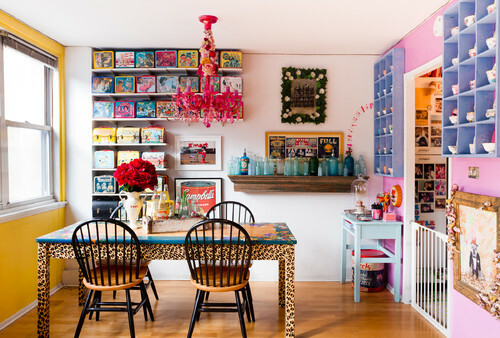 A designer can certainly help you develop a style, but you can also jazz up your abode with art you love, mementos from a faraway trip, or a collection that has special meaning.